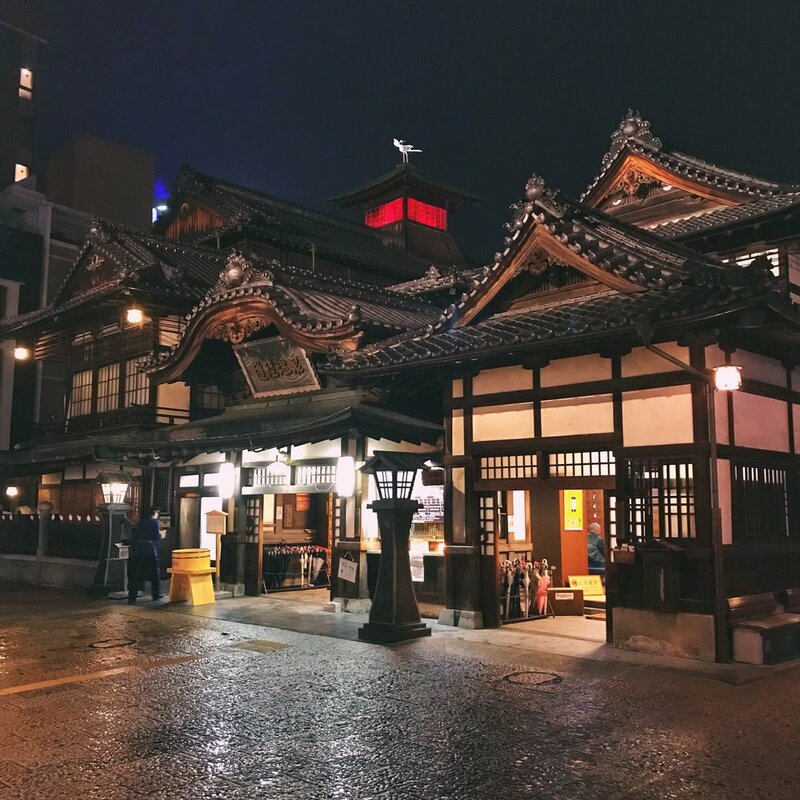 In the third part of the series, we enjoyed a day of rest in Matsuyama and spirited ourselves away to Dogo Onsen, known as one of the oldest onsen in Japan! After a few days and more than a few hundred kilometers of cycling, we were very much looking forward to our visit to Matsuyama. Located at the northwestern part of Shikoku, Matsuyama is the capital of the Ehime prefecture and is home to the Dogo Onsen Honkan bathhouse, dating from the Meiji Period, and served as the inspiration for the award-winning film “Spirited Away” by Hayao Miyazaki’s Studio Ghibli. Needless to say, we were excited! 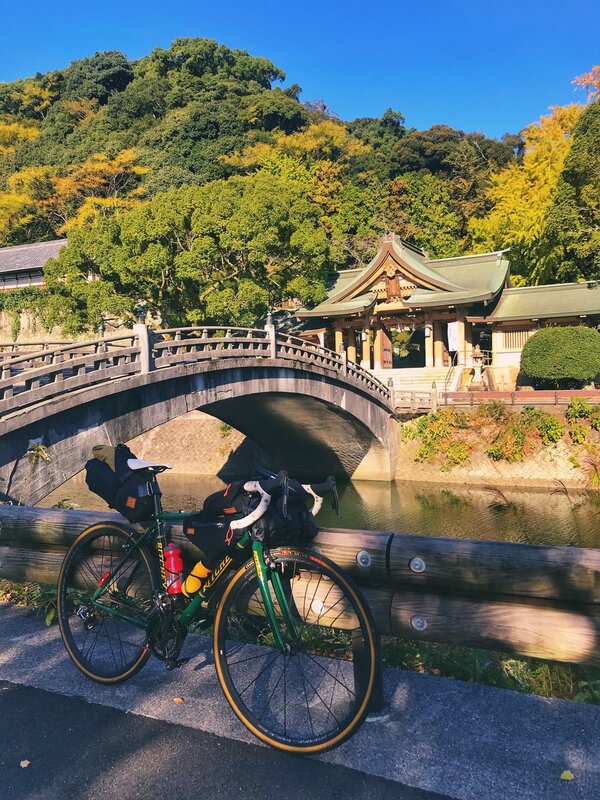 This is a continuation of our journey from Cycling Shikoku, Japan: Part 2. 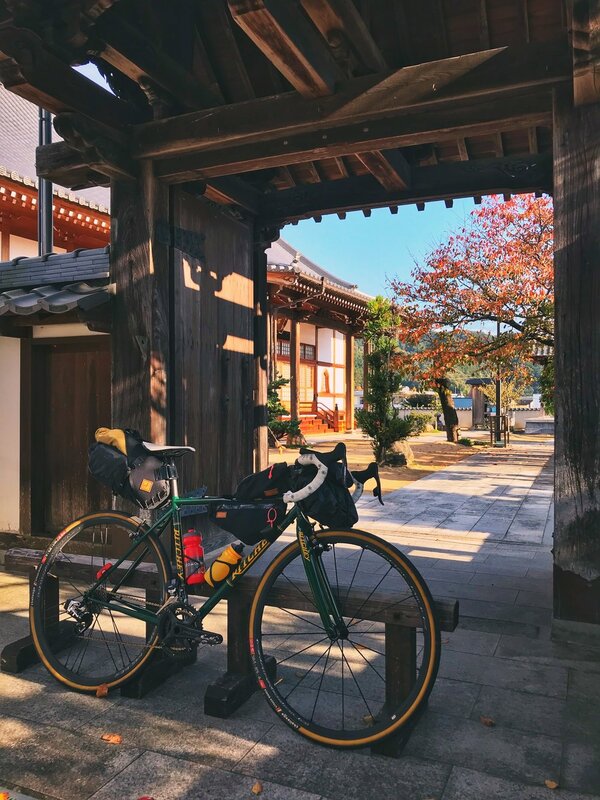 You can also start from the beginning in Cycling Shikoku, Japan: Part 1, or start even further back with our day of exploration in Tokushima. 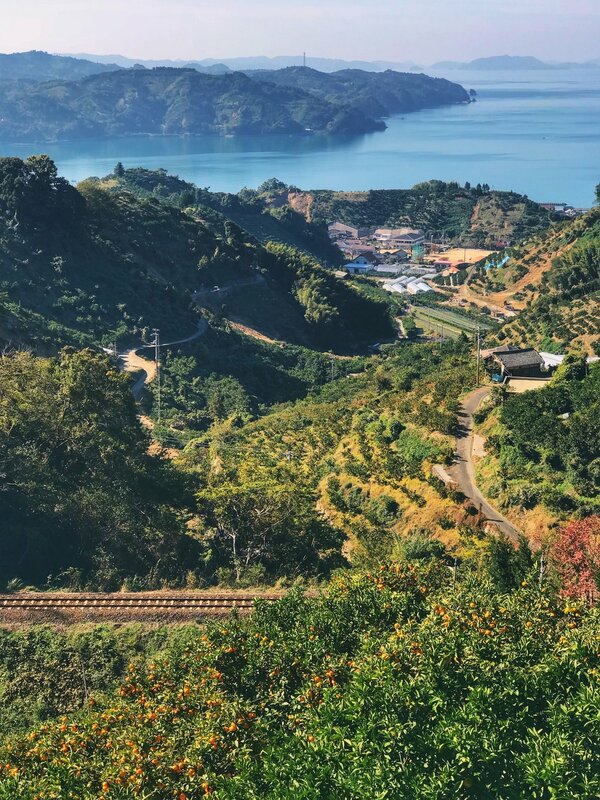 Also, for those who are coming from the Shimanami Kaido cycling highway and entering Shikoku, Matsuyama is merely 50km away on beautiful coastal roads. Getting to Matsuyama from Uwajima in a single day was going to take a bit of extra effort as it was another gran fondo with plenty of climbing. If we had an extra day, the alternate route would have been to head west along the coast and make a stop at Yawatahama. However, the treat to our chosen route was that we would get to make a lunch stop in the historical town of Uchiko. After a generous breakfast at our inn, we followed Route 56 out of Uwajima. At barely 10 kilometers out of the city, we were already treated to our first climb, and this would continue for the next 10 kilometers. This was perhaps one of the more challenging climbs we’ve had to deal with, as it was a constant 6 degree gradient at a minimum. Luckily there were small breaks in between, but they were far and few. So it was a gruelling 10km climb until we reached the top, but we were rewarded with beautiful views of the cove in the distance. Upon reaching the top of the first climb, it was yet another steady climb for the next 10 kilometers to the next peak with a nice sudden gradient increase towards the end that was almost 20 percent. After catching a breather at the top of the peak, we made a fast descent into the town of Ozu and made a quick stop at a convenience store for refreshments. The town of Uchiko in the middle of the valley was just a short distance away along Route 56 and our stomachs were already rumbling. Uchiko made a wonderful halfway checkpoint at the 50km mark, although we arrived during the later lunch hours. Luckily, it was a lovely Sunday afternoon and there were plenty of places to grab a bite. We stopped at one of the traditional restaurants for a bowl of Kuro-don to regain our energy. Uchiko is a wonderfully sublime historical town with an industrial heritage to the manufacturing of candles. In the nineteenth century, Uchiko was known throughout Japan and abroad for the quality of its vegetable wax. Where the merchants of Wakimachi became rich from the indigo trade, the merchants of Uchiko gained their wealth from making quality candles. You can visit well preserved heritage homes along the Yokaichi Historical District. We wished we had more time to explore the town, and in hindsight, it would have been better to at least spend one evening here. There is a lot of history to explore in such a small place, and I would imagine that you would keep discovering new things with repeated visits. Here is a great resource that describes all the things you can explore when you are in Uchiko. After Uchiko, the next 20 kilometers would be another gradual climb through another valley along Route 56, followed by a 10 kilometer descent into the neighbouring coastal town of Iyo before we finally reached Matsuyama after sunset. Our delightful host along with our forwarded luggage would be waiting for us. As far as rest days go, we hit jackpot in Matsuyama. 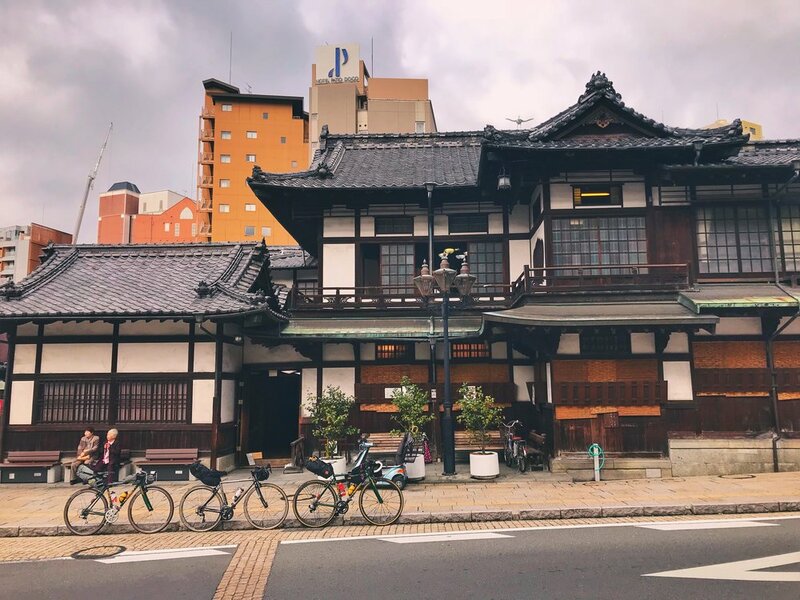 We stayed in a beautiful traditional Japanese home with a fantastic host, and it was only a stone’s throw away to the Dogo Onsen historical park. Dougo Yado Guesthouse was an amazing find on Airbnb, for us, and I would highly recommend staying here. We booked it through Airbnb, but you can also book it through several different platforms, including booking.com, Expedia, Agoda, hotels.com, and a few more. The place is run by Tsuyoshi, who was one of the nicest hosts we have ever had the pleasure to meet. First of all, the guesthouse has a spectacular location, about 500m of easy walking distance to Dogo Onsen itself. The short walk goes through a quiet residential area, which means no parties or loud noise making beyond 10pm, but also means you will sleep quite soundly there. We sure did! This was also partially due to the futons and bedding at the guesthouse, lovely clouds of soft whiteness waiting for us after a hard day of riding through the mountains. The feeling of snuggling under the covers at the end of a tiring day was out of this world. The home is beautiful to boot, with lovely traditional touches like Japanese figurines and art. The house has almost everything you need: laundry, a working kitchen, all manner of toiletries (including sanitary pads for the ladies), pocket wifi, charging ports and cables – you name it! Tsuyoshi really thought of EVERYTHING he could have to make his guests comfortable. There were also handy visitor guides at the kitchen, for ideas on where to go and what to do. Tsuyoshi was there to help us check in even though we arrived after nightfall, giving us a quick tour of the house and his personal recommendations in Matsuyama. He was also a great help when the local Family Mart (just around the block) could not send our bike cases off via Ta-Q-Bin pick-up service, helping to send our oversized luggage to the company’s nearest office even though he had to make a quick run from his office, which was half an hour away! According to legend in the ancient Nihon-shoki history book, a white egret came across the bubbling hot springs of Dogo around 3,000 years ago. The local villagers witnessed the egret dipping its injured leg into the healing waters, and in doing so, cured itself. From that moment on, it has been marked as a sacred place and the birth of Dogo Onsen, the oldest in all of Japan. You can see the symbol of the white egret everywhere, the most notable one perched at the top of the onsen’s watch tower. The main wooden structure of the bathhouse known as Kami-no-Yu Honkan was established in 1894 by Yukiya Isaniwa, the first mayor of Dogo Yunomachi. The architecture of the building itself was designed by Matahachiro Sakamoto, a craftsman from a family of master carpenters known for their work on the Matsuyama Castle. In 1994 it was the first public bathhouse in Japan designated as an Important National Cultural Asset, and in 2009 it was awarded the top rating of 3 stars by the Michelin Green Guide for Japan. Discover more! Visit the official website of Dogo Onsen. All of the onsen package details are described with ticket pricing. We opted to to get a private room to relax in after the bath. For 1,550 yen, you get a yukata to use while you are there, towels, tea, Botchan dango dumplings, and viewing of the Yushinden. For the onsen baths, we had access to the larger Kami-no-Yu (bath of the gods) bathing area, and also the smaller Tama-no-Yu (bath of the spirits) bathing areas. For those who have never been to an onsen before, a visit to Dogo Onsen would make for a fantastic and absolutely memorable experience. Before going to an onsen for the first time, please be sure to become familiar with onsen etiquette. Stepping into the Dogo Onsen Honkan is like stepping back in time. Its wooden interior is a labyrinth of stairways, passages and rooms; different layers built on top of one another over time. What was amazing despite the hustle and bustle of guests and visitors was that this old bathhouse had the illusion of space – it felt a lot bigger inside than it seemed from the outside. We soaked ourselves in the luxurious and more private and gender separated bath chambers of Tama-no-Yu, lined with granite and marble. We immersed ourselves in the soul-reviving hot water that is said to be a soothing alkaline blend pumped from eighteen different wells. It was a wonderful moment of relaxation and meditation, and a splendid way to soothe the muscles. After enjoying our time in the bath and relaxing in our private room, we took the rest of the day to explore the shopping arcades around the old bathhouse. For both domestic and international visitors, the eclectic mix of shops had a great selection of authentic local souvenirs from Sakurai lacquerware, Uwajima pearls, Tobeyaki ceramics and Imabari towels (seriously, you must try the towels). For Studio Ghibli fans, there is even a Ghibli shop to make the visit complete! Before bidding farewell to Matsuyama and Dogo Onsen, we repacked the contents of our suitcases before sending it to the nearby Yamato office for the luggage transfer service. Our fantastic host Tsuyoshi went out of his way to provide help in transporting our suitcases to the neighborhood Yamato office, where it was then designated to be transferred to Onomichi and would arrive there within 3 days. Tip: If there is a nearby Yamato office that can do Ta-Q-Bin luggage transfers, it is much cheaper to go there rather than doing the luggage transfer from a convenience store. Convenience stores will always charge extra handling fees. After saying our goodbyes, we were back on the saddle on our Ritchey Breakaways and made one last loop around Dogo Onsen. It just so happened that as we passed by, we were fortunate enough to catch the mesmerising mechanical show of the Botchan Karakuri Clock. Heading out of Matsuyama, we decided to take a shortcut. Unfortunately, the route we chose went through some seriously steep hills with gradients a little over 10 percent. On a good note, it was a very green route that did not have much traffic at all. Although it was only a 5 kilometer climb, it left us a bit exasperated at the top. Oh right, and then there was a second peak immediately with the same steep gradient for another 1 kilometer. In hindsight, it might have been easier to take the slightly longer but flatter route through town, but there would have been a lot of traffic lights to deal with. After the climb, it was a nice descent into the seaside town of Horie-cho. We found a quaint cafe that reminded us of something that you’d discover in a Studio Ghibli animated film. It was a humble little seaside home that served home cooked food and tea, and it also served as the neighbourhood venue for family activities. The hosts were wonderful people who immediately knew we were travellers, and presented us with small gifts as a token of their hospitality. Quite charming! The next 40 kilometers to Imabari was a beautiful coastal route with wonderful views of the Seto Inland Sea. We took our time, soaking in the views of the splashing waves, and trying our best to cut through some of the headwinds. We made several stops at a few seaside lookout points along the way, enjoying some hot refreshments when we could. 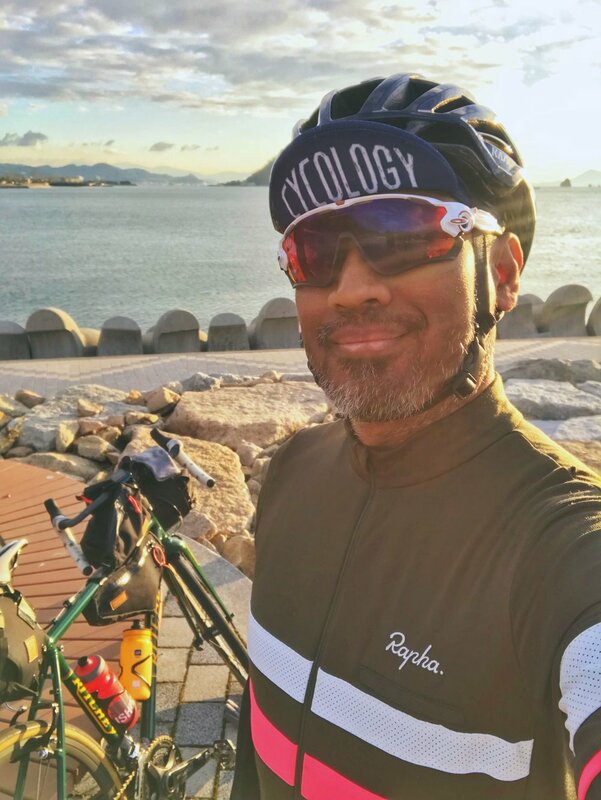 After enjoying the final moments of golden hour by the beach, we pedaled non-stop past sunset until we reached Imabari, where a delicious dinner of kaiseki-ryori dishes waited for us at the hotel for the evening. This would be our very last dinner on the island of Shikoku, as we would be making our way back to the main island of Honshu on the following day. Continue the journey and see our routes heading into the Shimanami Kaido. Meanwhile, you can also read our tips about packing light for a cycling tour.